Obsolescence is the threat looming over every streaming host in People's Republic of Desire, the same that hangs over many content producers in the internet age. As the hosts speak to tens of thousands of viewers, generating small fortunes while doing so, they always need to consider how to not only keep up with a fickle public and advance –– they need to fight for what they've already achieved. The documentary, directed by Hao Wu and presented by PBS Independent Lens, focuses on some of the hosts, fans, and patrons for the Chinese streaming video platform YY. As the audience sees it, the site exploded in popularity and continues to grow year after year. Hosts stream video of them talking, singing, yelling, dancing — anything to entertain their online room. Fans, in turn, can reward the hosts and potentially get noticed by buying gifts like digital flowers and diamond rings with real currency. YY's schedule culminates in an annual, 15-day competition which, among other things, names the best male and female hosts by fan vote. Votes, of course, are purchased, with some fans even telling the camera they'll spend more than their monthly wage during the competition to ensure their favourites wins. Wu finds a pair of hosts, Shen Man and Big Li, to track. The former has a catchy story: a nurse who was discovered and developed into a singing YY host. Off-camera, her jobless father and stepmother have moved in with her, with no set date for their departure. On top of that, she's navigating the odd lines drawn around YY fans and female hosts on the platform. Big Li gets the same observational, gently probing depiction. As the movie starts, he's attained some stardom as a passionate and angry everyman, something of an avatar for the aspirations of his male YY fans. He has a wife and child and a life that's more than comfortable, but he feels compelled to try to win the annual competition, at least to cement his livelihood for another year. Shen Man and Big Li help Wu suss out the unique ecosystem developed around YY. The film originally represents the main relationships as a triangle: of hosts who entertain fans and patrons, patrons who spend the most on gifts for hosts and fans who adore hosts and respect patrons for their wealth and willingness to spend. People's Republic can't stick with these flat three points, though. The relationships get trickier as agencies managing the hosts enter the picture and when you consider YY's own stake in everything that goes on. By the time the words "venture capital" are said in this film, the whole endeavour feels hopelessly mired, even if so many are willingly ensnared. Wu takes a full view of how the platform exists as a system while also discovering the individual stories within it. Just as remarkably, she takes subject that intersects online and offline worlds and makes a film that flows between them easily and without judgement. 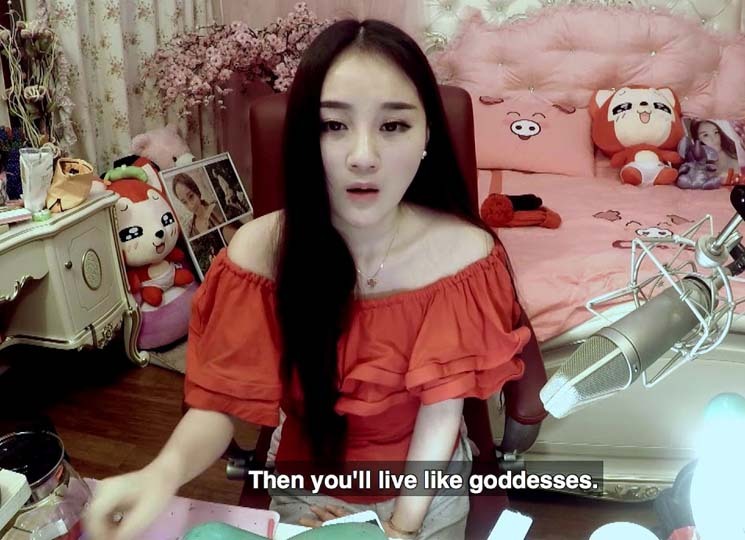 Watching this view of China's online entertainment, I kept thinking about an interview I've watched with Canadian YouTuber Johnny Orlando who, at the age of 15, I heard say that "realistically" he'll be "past [his] prime" in ten years. The struggles of everyone in People's Republic of Desire make that seem a little less outlandish to me now, though no less dark.